This handy full length mirror takes little space in your bedroom. Mirror tilts on special pivot hinges. 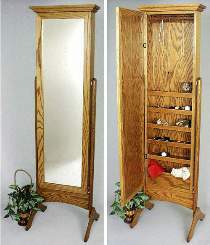 Door opens to reveal hooks for hanging necklaces, as well as shelf compartments for rings, earrings, and other jewelry. Keeps your jewelry where you need it, when you need it. Use standard 12" x 48" mirror. Order #1116 Special and save on the plan and hardware. #1115 Bedroom Mirror Jewelry Cabinet Hardware includes non-mortise hinges for door, pivoting mirror hinges, magnetic catch, wood pegs and turn buttons with screws. Project plan, mirror, wood and wood finish not included in the hardware package.